BackCheck in Action - Examples of how pre-employment screening works! A woman applied to work at a call centre. On her BackCheck consent forms she claimed to have been convicted of assault. Her Criminal Record Check told a different story: it turned out that this candidate had 95 other convictions including theft, counterfeiting, forgery, fraud, armed robbery, drunk driving, and more! The lesson learned is that we shouldn’t trust the honesty of criminals. When a recent health care candidate provided inaccurate information about his identity, BackCheck cross-referenced the consent forms with the candidate’s photo identification revealing that he lied about his name and date-of-birth. The criminal record check uncovered several offences including two incidents of sexual assault. BackCheck’s meticulous cross-referencing of data during criminal record checks catches the candidates that may otherwise slip through the cracks. An individual ordered a Criminal Record Check on themselves using myBackCheck.com. The result of the check was delivered back to the individual with a result of NOT CLEAR. The applicant then printed a paper copy of their result. The very next day, the individual presented the paper copy they printed with a CLEAR Criminal Record Check to their potential employer. To verify the result of the check, the employer called BackCheck. However when BackCheck went to verify the results, we could only find a NOT CLEAR result associated with that individual. In addition, BackCheck could not locate a file with the serial number on the certificate. A scanned copy of the certificate was sent to BackCheck from the employer and upon review, we found that the certificate had been digitally altered to display components of a CLEAR check a friend completed 3 weeks before. The result statement and the file number were changed. The hiring manager would not hire the individual for this position without a CLEAR check, and is furious at the applicant for dragging out this process for three weeks! The hiring manager stated that they want the applicant charged with fraud for providing a false document. In addition, the applicant/fraudster has also called BackCheck multiple times that day. First, claiming to be a hiring manager calling to verify their own results. Second, they called and asked that BackCheck not disclose any information to anyone if they call about their check. We informed them that an employer did call, and we simply said that we do not have that serial number on file. Realizing that they will not be able to fraudulently use our Criminal Record Check, BackCheck was told that this individual was going to go to the RCMP to get a paper copy from them instead. Any bets on what they’ll do with it? This is a great example of the perils of paper, and why BackCheck’s forgery-proof delivery of Criminal Record Checks is so meaningful to employers. A reference interview conducted by BackCheck brought out some startling facts about a poor candidate. The candidate’s time keeping “fell below acceptable standards”, the candidate felt “victimized” by the way tasks were handed out, and on one occasion did not show up to work “despite recently having been given a very detailed set of protocols.” The candidate had held a position which did not warrant skipping work. They had worked at a nuclear plant, surveying equipment and personnel radiation rates, and keeping a log book of radiation exposures. The candidate was not recommended for further work in the nuclear sector. Not all reference interviews are positive, and some may even be disastrous. It pays to check your references. BackCheck’s HR Interviewers are experts in identifying nuances of speech during the reference interviews they conduct, and carefully pursue clarification of discrepancies. When a candidate’s reference hesitated in explaining why the candidate had left their prior position “to return to school,” BackCheck asked for additional details. The reference stated that the candidate had left to go back to school, but had also demanded to continue to be paid, even though they were no longer employed. BackCheck’s investigative techniques frequently uncover fraudulent activity in all sectors of employment. BackCheck contacted an applicant's former place of employment where the applicant had been employed as a security guard. The HR manager referred BackCheck to the security company that the employee had actually been employed through. Upon contacting the security company, BackCheck discovered that the applicant was terminated for serious theft and other work related offences! A reference told BackCheck that she had known the applicant for several years and provided positive details pertaining to the applicant’s work history. BackCheck then contacted the company directly to verify the applicant's employment. The HR manager at the company checked employment records and found that the company had never actually employed the applicant! Upon further examination and contact with the applicant and reference, BackCheck discovered that the reference was in fact the applicant's mother, who had provided a false reference for her daughter. BackCheck maintains proprietary internal databases that include the HR contacts of thousands of organizations and companies across the UK, North America and Europe. Our proprietary information ensures that our HR Interviewers verify information directly from the source. When a recent candidate impersonated an HR contact in an attempt to provide an employment verification, BackCheck was able to catch the candidate in the act, and notify the client of the candidate’s deceitful behaviour. BackCheck contacted an applicant's current place of work to verify their employment as a network technician. Upon contacting the HR manager, BackCheck discovered that the applicant was not currently employed as claimed. Apparently, the applicant had disappeared from work for several months and then suddenly appeared at the company asking if there was any work available. The HR manager proceeded to state that the applicant is definitely not eligible for rehire at their company. BackCheck was conducting an Education Verification on an applicant for a client who claimed to have a Bachelor of Arts. After verifying the institution and submitting the file, BackCheck received a response stating that the applicant had not only not graduated, but had only completed 15 of 90 credits. As we had the diploma on file, we wanted to verify this information (perhaps they had 2 individuals with the same name, who were in the same program). BackCheck called the school and explained the situation, and upon further investigation it was discovered that the Diploma was a forgery. The forgery was a good one – they picked up on it because a couple of the signatures at the bottom looked suspicious! The applicant claimed to have attended Canterbury University. BackCheck’s database indicated that there were two schools by this name. One was a legitimate university and the other was a known diploma mill. BackCheck contacted the client for the location of the school to confirm which school the applicant was referring to. The applicant then sent in a letter meant to prove that the school was accredited. BackCheck was able to confirm that the school was not a legitimate institution. We then proceeded to verify two other credentials provided by the applicant which also turned out to be false claims. BackCheck was informed by the college’s records department that they were unable to locate any record of the applicant. Since BackCheck was not provided with the applicant’s student number, we contacted the applicant to request this information in case the school was mistaken. When the applicant was contacted, she admitted that she had never attended the school and had “mistakenly” added it to her resume. Bobby seemed like a perfect candidate. His Criminal Record Check and Credit Bureau Inquiry were both clear and his References were glowing. However, his Education Verification revealed that instead of having his high school diploma, Bobby had only completed up to Grade 9. BackCheck was asked to verify the credentials of an applicant for an accounting position at a large firm. The applicant had claimed to be a CGA and to have received a Bachelor of Accounting Science at a major Canadian university. BackCheck contacted the university and discovered a "Bachelor of Accounting Science" degree program did not even exist at the school nor was the applicant ever a student. 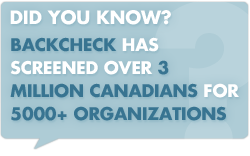 BackCheck contacted the CGA association of the applicant's province and discovered the applicant had not received their CGA designation. A candidate applied to be a delivery driver with a BackCheck client. BackCheck conducted a Driver Abstract and revealed a speeding offence. The candidate was caught driving 60 kilometers over the speed limit, while passing an emergency vehicle. Needless to say, the client determined that the candidate wasn’t suitable for a driving position.